Hey Christian filmmakers, if you want to save the genre, this is the movie you need to imitate. 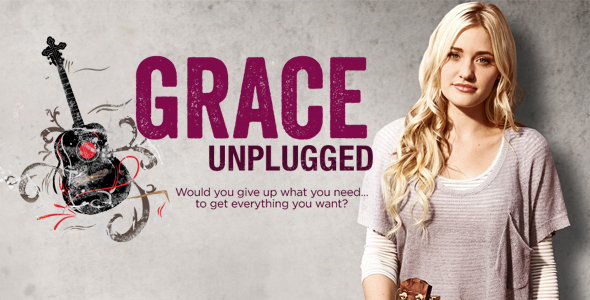 This is my review of Grace Unplugged! Grace Unplugged is a family drama that centers around Grace Trey and her father Johnny Trey, a former rock star turned music minister. The opening scene tells you (very subtly) that though they play in the church band together, there is tension between musical talent Johnny and the equally talented Grace. When Johnny’s old manager Mostin tries to get him back into the secular music world, Johnny politely declines, but Grace goes behind her father’s back by sending Mostin a demo of her singing. She enters the world of secular music and is given a new identity as Gracie Trey. However her inability to write her own songs and the rift she has caused within her family hinders her path to stardom. Aj Michalka gives an impressive and sincere performance as Grace. Though at times she tends to rely on the “deer-in-a-headlights” look in the second act, her facial expressions convey the protagonist’s inner turmoil. Aj Michalka portrays a frustrated girl who expresses herself through music and just wants to be free to create. James Denton plays Johnny Trey, and he gets the most transformation as a character. I hated him in the first half because of how uptight and overbearing he was, but his journey into humility made him more sympathetic until I finally gave in and changed my mind about him. This movie succeeds at having both Grace and her father learn a lesson; Grace learns not to throw herself into a world that she’s not ready for, and Johnny sees the error of his suffocating Grace’s talent. The film does a great job at not letting the message clash with the story. The humanistic script allows the characters to be living, breathing people and not become Bible-belt stereotypes. The God-dialogue sounds like it’s coming from the characters and not part of an agenda. The filmmakers understand that our God is not a forceful God, so they avoid forcing His role in the story. By allowing God to be in control without shoving Him into clumsy dialogue, the moral that God is in control is able to flourish in a natural progression. People, this is a freaking good Christian movie. It’s a believable family drama, a well-thought character study of Grace and Johnny, and the music is pretty awesome. I’m gonna go ahead and say it: Grace Unplugged and Soul Surfer are the movies that are going to save the Christian movie genre if filmmakers follow their example. There is hope for this genre, and it’s movies like Grace Unplugged that are going to lead the way.